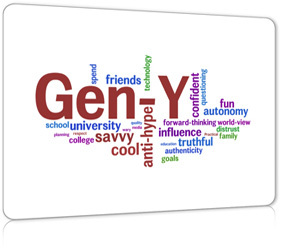 “Generation Y” or “Millenials” seem to be taking alot of heat these days. There are many articles about how materialistic & less willing to work they are, how they seem to be the cause of the decline of the modern economy, and how they will transform the workplace once they get their hands on it (when the boomers finally get out of the way). What you don’t seem to hear much about is how driven they are, how committed to achieve they are or how they also have goals and dreams. In my coaching practice, these are the Gen Y that I see every day… they are motivated to improve and grow as human beings, they are passionate about what they bring to the world and they are eager to learn, both how to achieve within the existing “workplace systems” and how to make changes for the better. I was thrilled to read the blog post by Jenny Fukumuto at Switch & Shift about how challenging it is to be a millennial overachiever. With the average Gen Y being 23 years old, they are getting their feet under themselves in an economic period that is anything but certain. Just as in generations before them, there are people in every group that are driven, hard working and passionate about making a change. A difference for this generation, is that coming of age in an economic downturn, many of them have chosen the less traditional path – they have chosen to put their confidence in themselves and pursue entrepreneurship or solopreneurship. With nearly 60% of Gen Y professionals considering themselves Entrepreneurs at heart, the marketplace is going to need to redefine what “successful” looks like as it no longer directly translates to climbing the corporate ladder. These Gen Y overachievers are driven, passionate and making a difference – just not in the way that it looked in the past.